His name was Kevin but his keepers called him Zoo Boy. He didnt talk. He hid under tables and surrounded himself with a cage of chairs. He hadnt been out of the building in the four years since hed come in. He was afraid of water and wouldnt take a shower. He was afraid to be naked, to change his clothes. He was nearly 16. Hayden writes very readably. Though Kevin must have been scary, he is rarely scary to her and this is not a frightening book. It is reassurance we all need. In the wreck of this world, love still works. We can heal each other, if we listen. 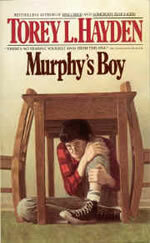 MURPHYS BOY (SILENT BOY) remained Toreys favorite book for many years. I felt I had found my writing voice with MURPHYS BOY,  she says. Torey has lost track of Charity. Hi. Im the person who was Kevin in Toreys book, MURPHYS BOY, and I want to say that things are okay for me now. I graduated from high school and then I went to community college for two years. I got a job in a hospital after that and I am still working in the same place. I like it very much. I got married to my wife Sue after college and we have a wonderful little boy named Daniel. He is the most important thing in my life and I try to be a good father to him. He is a happy boy who loves baseball so I think we are doing a good job with him. Now we also have a second son who's name is Matthew.